Crowd-funding efforts for "the most portable TV games console ever" raised over $647,000. GameStick, the Android gaming console on a stick, ended its Kickstarter campaign this morning after a successful round of crowd funding. Developer Playjam's original goal for GameStick was $100,000, but the Kickstarter surpassed that shortly after launching. Even after meeting its goal, people kept contributing to the Kickstarter for incentives like additional colors and a microSD card slot. As a result, 5,691 backers pledged a total of $647,658, which is nearly 648% of GameStick's original goal. Described as "the most portable TV games console ever created" by Playjam, GameStick is on track to be released in April 2013, according to a press release. Playjam CMO Anthony Johnson said that he was "overwhelmed, excited, grateful, thrilled, and everything in between," but added, "this is just the beginning." Johnson stated that the feedback from Kickstarter backers had been helpful in shaping GameStick's design, and Playjam will continue to seek supporter input. 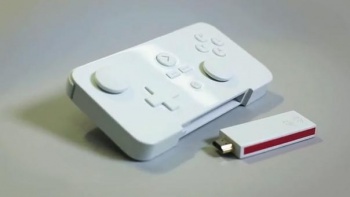 If you missed out on the Kickstarter, you can still pre-order your own console on a stick at the GameStick website. With two Kickstarter-supported Android consoles set to launch in the coming months, along with the rumored successors to the PlayStation 3 and Xbox 360, 2013 is shaping up to be a very interesting year for the gaming industry.